Everyone knows that fresh fruit is truly unique. However, it is not always possible to have seasonal fruit available to be enjoyed. For this reason, Perry Court Farm decided to process and conserve its apples, which are grown according to the principles of organic farming, in order to offer them in an innovative and light format. These crispy apple slices, made from tangy apples, are dried for more than 12 hours at a low temperature. The result is a soft and delicious snack, perfect to always take with you to fend off hunger with the good taste of nature. Ingredients 100% apple. Allergens: possible apple allergy. For more information on product labels, please contact our Customer Service department. The information on the labels of the products may vary for reasons beyond our control, therefore, there may be discrepancies between the information on the site and that on the products delivered. Please always check the information on the product before consumption or use. 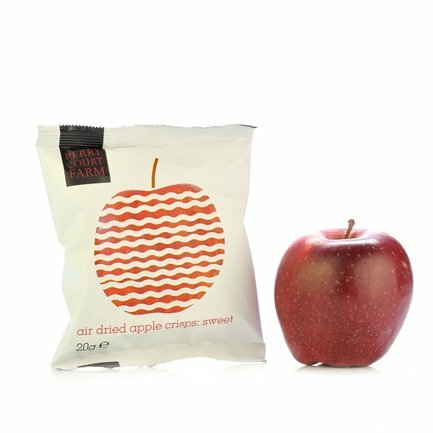 Perry Court Farm is a small company located in Stour Valley, in the heart of the English countryside, surrounded by the orchards and fields that grow the ingredients that characterise the company's optimal products. Perry Court Farm has been growing fruits and vegetables for three generations, with full respect for the environment. The traditional cultivation methods, in combination with the technologies for sustainable agriculture, make it possible to obtain truly health products that are distributed directly to consumers or processed according to artisan methods for obtaining delicious and light snacks that are able to satisfy your craving for something good with genuine ingredients.